Weighing only 1.2kg (2.65 lb, body-only) with a compact form factor [135 mm (W) x 133 mm (H) x 170 mm (D) | (5-5/16 inches x 5-1/4 inches x 6-11/16 inches) whilst there are a multitude of mounting holes across the camera body for building the camera up. The top-handle can also be removed, whilst the hand-grip can be repositioned or taken off completely to create a compact form factor ideal for rigging the camera into drones, gimbals and jibs. 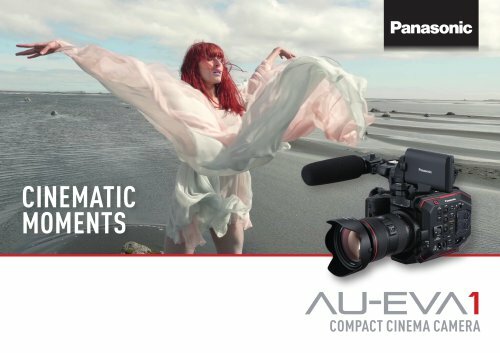 CREATIVE TOOLS HIGH SPEED SHOOTING The EVA1 offers high-speed Super 35 mm capture up to 59.94 fps/50 fps for 4K/UHD or up to 120 fps/100 fps for 2K/ Full HD. Higher speed capture is possible up to 240 fps/200 fps by cropping the image area (4/3-type). EVA1 will have a remote-control app for a tablet (iOS, Android) that enables users to control an EVA1 when the camera is on a camera crane, or remote location.1 The optional AJ-WM50 Wireless Module is required. Other optional wiress module will be updated accordingly on the website <http://pro-av.panasonic.net/en/>.